Long the land of basic flip and bar phones, TracFone's finally getting some more interesting devices. Last week Trac launched their first touchscreen phone, the LG 800G. 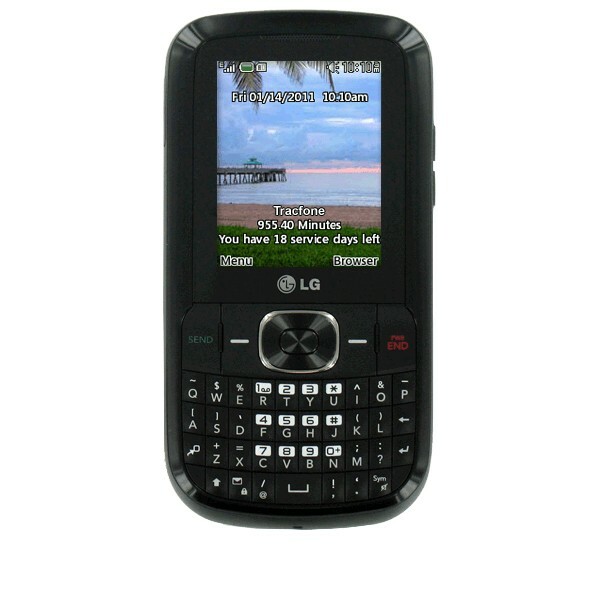 They followed that up today with their first ever QWERTY, the LG 500g which is available now on the Tracfone Website for $29.99 You can get another $5 off by using coupon code GI2011 at checkout. Overnight shipping is free through Mother's Day,May 8th. The LG500g is currently available in AT&T areas only. If you don't see and are sure you have AT&T service try using zipcode 94102. After you add the phone to your cart you can change the zip back to the proper one. This looks good -- I think wife wants to upgrade to this, while I go with the 800. Anyone know if you can purchase skins or covers for this phone yet? found some for the 900G -- is that the same structure as 500? Is this available in stores yet? Such as Walmart? I found this phone at Radio Shack last week for $19.99. Not sure if it is still on sale. Has anyone figured out how to put a sig line in for messages on this phone? I can't find the option anywhere. Oh, and the 900 is bigger than this, so skins won't work one for other. THANK GOD!!! Finally a better Tracphone! Got 2 of them last week, shipped FedEx not available for sale here as yet. They work well, great battery life, and Mp3 capable..much better than my old crapphone. Am looking for nice cover as well..no luck yet. By the looks of it this LG500G seems great for texting because of the qwerty keyboard and this phone doesn't look cheap and prepaid. At the price of $29.99 which includes the DMFL (valued at $19.99)this phone is going to be wanted by all the kids and they're going to throw away their simple candy bar phones in contempt. I have a tracfone now, but I want one with the qwerty keypad. I'm almost 14 so I want something that is worth the money since I pay for it. Do you think it is worth the extra money? Also, does it cost minutes to take a picture? The 500g is a decent phone and I consider it worth the money though you might want to watch for sales at RadioShack, BestBuy, Costco etc. as TracFones often go on sale. It doesn't cost anything to take a picture and you can transfer pictures to a PC using a cable for free. Sending a picture message will cost 1.5 or 2 units. I just bought the 500G, but wish I would have seen the 800 first. Oh well. next phone. It is nice to see Tracfone finally getting some phones someone might actually want. Is this phone better than the 900G? The 900G is the better phone; 2 MP vs 1.3 MP camera, bigger (2.4" vs 2.2") and higher resolution (240x320 px vs 176x220 px) screen. Also the 900g has an FM radio, the 500g doesn't. However the 500g is smaller, lighter and less expensive. does the 500g only have 9 speed dial numbers? anyone have trouble texting on the tiny keyboard? just wondering. i am getting this tmmr! how much memory can it support? The largest memory card the 500G supports is 4 GB. yeswap... any tips on transfering pics with a cable?? "see" the phone as a 'drive' in Windows explorer?? I believe that under Settings > Connectivity there's an option to select USB mass storage mode. Make sure it's selected. Also, it could be the cable. Some cables are intended only as charging cables and don't have all the pins connected. If you have or can borrow another cable try that. Does the browser on this actually work?? The browser works and you can install better browsers like Opera Mini or Bolt. I haven't seen any custom cases for the t301g but a mid sized universal case like this one would probably work. The LG500G is not Browser friendly. You just look at the button and .50 minutes are deducted. Tracfone should have had an option to activate or deactivate this Browser. They are just concerned in deducting your minutes. This phone should have had software to transfer pictures from phone to computer but again they are concerned about deducting minutes. When my minutes expire so does the Tracfone LG500G. I have been a Tracfone customer for 12 years but no more. They disappointed me BIG TIME I will find another phone company. Does anyone know how to operate the speakerphone on the LG500G? Thanks in advance! 1. Once you answer or place a call, press the key located in the center of the navigation keys. "Speaker On" will display. 2. To turn it off, press the key in the center of the navigation keys again. "Speaker off" will display. I want to buy this cell phone... But I have a cute iphone 3g cover... Do you think it will fit in this cell? The LG500 is selling for 99.95 on HSN TSV with 1300 minutes for one year with triple minus for the life of the phone. I think the triple minutes for life makes the a great deal. What kind of cable do you use to download pix/vids to PC? Of would memory card work? Would like to actually be able to print pix once taken. The LG 500g uses a standard Micro-USB cable like this one. You could also use a memory card reader. The pictures are jpegs once they are on the PC you can print them like any other jpeg image. If you are NOT using the web to check weather, surf, etc. can you turn it off so it does not take away minutes? Or do you have to have the web on all the time? I hate to have my phone just sit for hours or days(when I am NOT talking or texting) and when I go to to use it all my minutes are used because the phone is updating say the weather. Hope I am explaining it right....Thanks for all help in advance! TracFone doesn't offer an option to turn off the web. However, there is no app on the LG 500G that automatically connects to the web when the phone is idle so there won't be any charges for data unless you hit the browser button or run an app that uses the web. That answers my question at least I won't be paying unless I choose to use the web. THANK YOU SO MUCH!!! I guess I should have asked this question before I ordered it but I am glad that it works that way. how do you change the time and date?? mine says its 2004 and has the wrong time. help anyone??? Only TracFone can give you your PUK code which is unique to each SIM. You can use the Tracfone online support page. or call them. If calling, it's best to use the US based support number (1-800-876-5753 Monday – Friday between 8:00 AM and 7:00 PM Eastern Time) for "hard" questions like this. From the Home screen, click Menu (left softkey) then Settings (gear icon) then Date & Time and change it or select auto update to get the date and time from the network. Just got the LG500g yesterday from radio shack, love it!! Question: Am I able to take a picture and send to my email? Also, why cant I send a video to another phone? To send a picture to email send it to 36245 and in body of the picture message enter the email address you want to send it too followed by a space and optionally a message. 1. From the main screen, press the key below the word "Menu." 2. Using your navigation keys, go to "Messages," then press the key located in the center of your navigation keys. 3. "Create New Message" will be highlighted. Press the key in the center of your navigation keys. 4. Enter the recipient's number, then press the down navigation key. 5. Enter the message you wish to send, then press the down navigation key. 6. Press the right navigation key. "Video Clip" will be displayed. Press the key in the center of your navigation keys. 7. "Open Video Clips" will be highlighted. Press the key in the center of your navigation keys. 8. "Videos" will be highlighted. Press the key in the center of the navigation keys. 9. Select the desired video and press the key in the center of your navigation keys. 10. Your video will be displayed. To send the video message, press the key in the center of your navigation keys. Not all phones can receive or display videos. There may also be limitations on the size of a video that the 500g can send or that the other phone can receive. If you are still having trouble try sending a very short clip (under 10 secs) for testing purposes. That interactive tutorial doesn't work at all. Have clicked on several topics and all I get is Loading. i even let it run all night with nothing the next day. Useless!!!!! The interactive tutorial for the LG500G isn't working for me either at the moment. It did a couple of days ago. Hopefully it will be fixed soon. Neither the LG500G or TracFone provide a way to block texts. You should be able to get TMZ to stop by replying to one of their messages with just the word STOP in the body of the reply. STOP is the universal code that all reputable text marketeers have pledged to honor. sorry that this question has nothing to do with this phone but....... **does anyone know if i can download apps to my samsung t301g tracfone??? and if so what??? 1) Sound quality is good for standard calls. Not any different from the Verizon LG phone I've been using for the past few years. 2) My old LG phone from Verizon has a mini SD card slot on the side of the phone. The lg500g has a slot too, but it's under the battery, next to the SIM card! That just seems nuts ... it felt as if I was installing RAM in a teeny tiny laptop. You slide down and release the metal cage, put in the card, put the cage back in position, and lock it back. Replace battery. Replace back of phone. Not very convenient. 3) I was interested in using it to read ebooks. There are lots of them, for free, at Project Gutenberg. The only file format which seemed compatible (someone correct me if I'm wrong) is QiOO. This works fine, as long as the books aren't too very large. My lg500g gives me an "out of memory" error if the books are over 800k or so. Or, it might open them and refuse to load anything but the first chapter. 3) Unless you want to burn through your browser minutes downloading ebooks, mp3 files, etc., you can pre-load your mini SD card from your PC if your PC has either a SD card slot or if you have a SD card adapter for your computer. Much cheaper that way. 4) The lg500g works great as an mp3 player, using standard headphones (an improvement over my old Verizon LG phone). Remember to put the player on "shuffle" if you want to hear more than one song at a time. Some of these things might be common knowledge to a lot of you, but I thought they were worth mentioning. Thanks. "Anyone know how to use the voice recorder on the 500g?" 1 Press Menu and select Media, then choose Voice recorder. 2 Select Rec. to begin recording. 3 Choose Stop key to end the recording. 4 Press Options and select Play to listen to the recording. Is there a way to adjust the volume for the alarm? I have a question about the LG500 and the memory card. I installed a 4gb(max. for the phone I believe) and it does not show as active. In the upper left corner of the home screen near the battery and signal icons there is a little card with a red X over it. I have not been able to find out what that means. I even went in the memory screen and the memory is NOT highlighted so I can't turn it on to activate it. I tried to take out card and reinstall and still the same response. Can anyone HELP??! Please and thank you! The contents of the memory card should be listed when you press Menu and choose My Folder. If they aren't it could be a bad or incompatible card or the card may just need be formatted. There is an option to format the card in Memory >Memory Info > External Memory. if that doesn't work see if another device (PC, camera or a different phone) can access the card and format it. If all else fails try to return or exchange the card preferably for a SanDisk card. SanDisk 4 GB cards have been reported to work without issue in the LG 800G. I've never heard of an unlock mass storage code. What are you trying to do with the phone that it asks for a code? Ok, so when you connect the phone to the PC you get a prompt on the phone for a code, right? What exactly does the prompt say? that is at lgsuiet.com needs to be put on my pc to requinizes my phone,I will let you know if it works. Hm, I've never heard of lgsuiet and lgsuiet.com doesn't seem to exist. When you connect the PC and phone you should get a prompt that says "Mass Storage?" with "Yes" and "No" options. Pick "Yes" and it should connect. It shouldn't ask for a code. Seriously- Is there a way to adjust the volume for the alarm? When setting up the alarm on my old Motorola 376g I could choose the volume level, 1-7. WHAT TRACFONE IS THE BEST TO BUY??? That's impossible to answer without knowing what style of phone you want (flip, candybar, slider, QWERTY, touch screen), what's most important to you (reception, size and weight, texting, talking, battery life, web) and what's available in your area. Go to the TracFone site, enter your zip and find a couple or three phones that look like they meet you needs and come back and ask for options on thoese models. No Angry Birds won't work on an TracFone, AFAIK. BTW, typing in all caps is considered shouting and is rude. I bought this phone a month ago when I was downsized from my former employer (The cell phone I had was the company's). Very cool for a pre-paid phone. For the LG 500G, how many minutes does it take off if you text? For the LG 500G, how many minutes will it take off if you text? A text costs .3 units (minutes) to send or receive on the 500g and all current TracFones. Awesome! What about web browsing, calling and receiving calls from people? Is that the same amount too? Web browsing uses .5 of a voice minute per minute of browsing. A minute of voice (calling or receiving) uses a minute of voice obviously. Do I need a 4 GB memory card to transfer files between my LG 500g and my PC? I am currently trying to transfer files to my phone from my PC with a cable, but my PC does not recognize my phone. I am sure that the cable is for downloading files, not just for charging. When I connected my phone to my laptop, I did not receive the prompt for "Mass Storage?". Yes, you need a memory card, 4GB or less. The phone's internal memory is locked down and hidden, only the card is readable using a PC and USB cable. @yeswap do i have to have a memory card in order to put music on the lg500g and if so can you recomend one to me please? Yes, you need to have a memory card to use the phone. It needs to be 4GB or less. SanDisk is a good brand. There should be an easier way to find out how to raise the alert on a LG500g phone when receiving a text msg. When you get a text the phone should beep and display an envelope icon in the top status bar. Is that not happening? Yes that's happening, but, the beep is hardly noticeable. My real question should have been how do I raise the sound of the beep on the text signal? Don't take chances with cases/ skins that might fit. I bought three from fatorder.com for $4.99. They are great! Thank you, Yeswap, you have been very helpful to many! How can I silence the keypad sounds? Press the left soft key (labeled "Options") and choose "Edit"
Scroll down to "Key Tone Volume"
The LG 500G does support Java. My posts never show up. Let's try again. It took two tries but my LG500g finally recognized the 4GB microSDHC Card I installed. I went to format the card and it is asking me to enter a security code. What's up with that??? Do I need to format the card? This is just camera habit on my part. Hmmm...posted 2 days ago and now it's gone? How do I get pictures on my phone To my laptop? I have a USB cord for it, but nothing happens on the phone or on the computer when I plug them in. Do I need some kind of a driver??? You need to have a memory card in the phone for it to show up on the PC. If you have a card in the phone try plugging the cable into a different USB port on the PC or use a different cable. I'm choosing between an android and this phone. I REALLY want this phone but my parents want me to get an android so I'll have PDANet for my laptop. For those of you who have used the LG 500G before, what do you think are the pros and cons of it? OK, got the memory card and can now transfer pics back and forth. I also transferred a ringtone file from my computer to the phone, but now can't figure out how to use the file as the ringtone. Is shows up under the "sounds" menu, but when I open it, there is no way to move it to the ringtones list. I suppose this is basic to most of you, but I am new at this and do not have a 12 year old in my house to help me along. Is there a way to get a new ringtome for this phone without having to do it via the phone's browser? As bad as I am at this stuff, I am guessing it will take me way too many of my minutes to do this via Tracfone's site, searching and figuring it out. Heck, I have already accidentally connected to the browser 4 times and wasted minutes!! AAGGHH! Never mind....finally figured it out. I was told,by ATT, I could put an ATT sim card (from an existing active plan. When it is put in the phone it says 'sim lock code 1'. ATT says I just need to get a new sim card, and tracphone says att sim cards are unusable in this 'ATT tracphone'...ugh. Do you know which is correct? you can't use a generic AT&T SIM in a TracFone. The only SIM that will work in a TracFone is the one that came with it or a replacement SIM from TracFone that is coded to work with that specific phone. SMS question. A text message has been received on the LG500g, and I have chosen to view it later. I am now in the in-box and have located the new, unread message. The sender is identified as New Message. Is there a setting that can be changed so that the sender of the message can be identified (in the in-box only) so I can determine if I want to read the message or delete it? I would hate to use units to read a message that is from someone I do not know. There is no know way to see the sender name or number without opening the message and paying. I'm sure that's intentional, TracFone wants us to pay :). All the recent Tracs are like that. Try formatting the card using the phone. Does this phone have roaming because I travel alot and don't want it to take 2 minutes for every minute I use. My current Tracfone is 1 minute not matter when I am in the country. i have this phone and its great but it has the striaght talk symbol on the back so does anyone know if u can put staright talk minutes on it ?? The 500G is a one rate phone, all current TracFones are. So there's no extra charge for roaming. A phone sold as a TracFone or NET10 phone can not be used on StraightTalk. Does it actually say "Straight Talk" on it or do you mean the concentric circles icon that all TracFone/NET10/Straight Talk phones have? The default unlock code for the LG 500G is 0000. If you changed the unlock code and don't remember what you changed it to call the TracFone Executive Resolutions Dept.1-800-876-5753 Monday – Friday from 8:00 AM to 7:00 PM EST. They should be able to give you the master unlock code. What's the difference between the Tracfone "Value Plan" and "Pay as you Go Plan"? 1. The Value Plans have cheaper minutes but you have to add money every 30 days, with the Pay As You Go Plans you only have to add money every 90 days. 2. You have to register online for Value Plans and Pay With a Credit or Debit card. With Pay As You Go you can use TracFone PIN cards that you buy at local stores or pay online. On both Value and Pay as You Go unused minutes roll over if you add monet before the 30 or 90 day expiration date. Is there a way to delete all text messages either sent or received, without having to manually go through and delete each one? I have over 300 sent messages and I'm now getting a warning that my message box is 95+% full. It will take forever to go through and delete them all one by one. Go to Menu > Messages > Inbox, tap Options then tap Mark/Unmark and then tap Mark All. Then choose Delete. Repeat selecting Sent instead of Inbox. Does it cost anything to add MP3 music to the phone and how do I do that? It fairly expensive to download music but it cost nothing if you copy it to the SD card from a PC. Copy your mp3s to the sounds folder on the card using a data cable or microSD card reader. I have some MP3 music on my computer right now. So your telling me to get a cable and copy them to the phone?.. I will be getting a cable and microSD memory card this week. Is there a way to program the home keys, or are you stuck with the factory default commands attached to the keys? Can this ophone play videos not taken by the ohone/cemar itself? (Assuming I have the MicroSD card). If so, what is the format? Can you play MP's over the bluetooth? If so, how? Retype: Can this phone play videos not taken by the phone's own camera? If so, what is the format of the files I need to place on the MicroSD card? Anonymous, if you mean listening to MP3s using Bluetooh stereo headphones, yes that works. Sqwertz, the phone supports 176x144px MP4 formatted videos with a framerate up to 30 fps, video bitrate up to 400 Kbps and 128 Kbps AAC audio. "Is there a way to program the home keys, or are you stuck with the factory default commands attached to the keys?" What do you mean by "home keys"? The 500G doesn't have a home key. If you mean the two soft keys on the left and right, just below the screen, I don't think you change them. By "home keys" I mean the directional keys. On all other phones I've had these are programmable with most menu functions. As for bluetooth MP3 listening, the sound eitehr comes out of the headset plugged into teh phone, or the built in speaker. There is a "Sent to -> Bluetooth Device" when listeing to an MP3 but that appears to only be a file transfer option. And it fails. The arrow keys don't seem to be programable either. Sad that stereo Bluetooth headphones don't work. I wonder if it's a incompatibly between the phone and the particular headphones you are trying. does this phone use a sim card? Yes, its a GSM phone so it uses SIM card. How do you get the senders adress to show (on a text) without having to open it??? You can't. You have to open the message to see the sender's name. Can I get on Facebook with the lg500g...and if so, do I have to download it or just get on it with the web browser? You can use Facebook's mobile site in the LG 500G's browser or install Opera Mini which is faster than the built in browser and supports copy and paste and tabbed browsing. At this time the Facebook app doesn't work on the LG 500G. How do I go about installing Opera Mini? Go to m.opera.com with the phone's browser and click the download link. Is there anyway i can get my tracfone to work in Europe if its from the US? No way, TracFone's are very locked down. Even if you could unlock them they don't support European cell phone radio frequencies. Do you know any other prepaid cellphone companies that do have the option to use the phone in Europe? If you are only going to one country it's always cheaper to take an unlocked GSM phone that supports Europe's 900/1800 frequencies and buy a prepaid SIM locally. can i use T mobile sim card for this phone? Is there any way to view a text file on this phone? I transferred a text file to the microsd card using a cable. The file shows up under "My Folder" but there doesn't seem to be any way to view the file contents. If you hit "View" it says "Unsupported File Type". I haven't been able to get any of the other apps to open a text file either. I suppose I could email the file to myself and read it using the gmail app but that uses up minutes. I shouldn't have to use minutes just to read a text file. "can i use T mobile sim card for this phone?" An actual T-Mobile SIM card, no. TracFones are locked to the SIM they came with. If you want to switch from a TracFone SIM homed on AT&T to one homed on T-Mobile, which only makes sense if T-Mobile has better coverage than AT&T where you use the phone, you can call TracFone and ask them to send you one. "Is there any way to view a text file on this phone?" You need to find and install an app that can open text files. Many eBook readers can. One possibility is Albite http://m.albite.vlexofree.com/reader. I haven't tried it on the LG 500G but the "Tiny" and "Light" versions work on most phones. I've tried to download the facebook app, but once downloaded it seems to want to download an update. The update never completes downloading (the phone displays "Connecting...." indefinitely)! The app that DID get downloaded is very buggy. The left and right soft keys don't do anything - leaving no way out other than by exiting the browser. 1) Are the symptoms that I documented the same as what you've found? 2) Who authors the facebook app (TracFone or facebook)? 3) Do they plan to fix this? 4) In the meantime, how can I clear the app from memory? 5) How do I (or do I even need to) specify the destination memory for apps (by destination memory, I mean the external microSD card vs. the phone's internal memory, for example)? 1) I wrote that it didn't work based on reports by other users none of which were specific about its defects. Haven't tried it myself. 3) No idea but reporting the issue with a comment at www.facebook.com/notes/facebook-mobile/facebook-for-every-phone/200217473360613 would at least alert them to the issue and make a fix more likely. 4) On the Home screen, press the soft key labeled "Menu", scroll to and click "Games & Apps", scroll to Facebook, press the "Options" softkey, scroll to and click "Delete". The reason that I asked question #5, was because the LG500G package states: "App capable - may require optional microSD card up to 4GB." What is this setting used for? I believe it's where the phone's camera will store photos. How is the sound quality on the mp3 player? If I'm using decent headphones, will I still get the same quality as say, a basic PC sound driver? Can it play 192kbps quality mp3s, at least? ""Is there any way to view a text file on this phone?" You need to find and install an app that can open text files." "The suite Albite Reader cannot be installed because the permission javax.microedition.io.Connector.file.read is not available on this device"
Based on that error message I agree with your analysis that TracFone or LG has disabled the ability for 3rd party apps to read files from the file system. If you have a Windows PC available you can use TequilaCat BookReader's Desktop Shell to create a self contained reader app that has the text file encapsulated in it. That shouldn't give the error as it doesn't need to access the file system. Instructions and link can be found in this post How to Read eBooks on Almost Any Phone that I wrote on another site of mine. I'm getting conflicting information in my research about included apps. I'm carrying around 2 PDA's because I cannot seem to sync the newest with my contacts from the oldest and the calendar no longer works on the older of the two. 1) Does the phone have a calendar included? 2) Can I load my PDA contacts to the phone or must I re-enter every single one of them (ugh)? I'd sure appreciate clarification. Thanks much! 2) If you can export the contacts from your PDA as a .vcf file, copy the file to the 500G's memory card. Then use the 500G's contacts restore option to import them. You can also send contacts to the 500G one at a time using Bluetooth. Yeswap- How big is it??? Just to let you all know, a transcend 2GB micro SD card does not work on this phone. Ext memory is grayed out, and you can't access the memory. I tried a variety of formatting options without success. The Sandisk 4GB microsd works just fine! Is there a way to delete the pre-loaded games? I want the additional space to download apps I will actually use. Try this: on the Home screen, press the soft key labeled "Menu", scroll to and click "Games & Apps", scroll to the app you want to delete, press the "Options" softkey, scroll to and click "Delete". If there's no delete option or if it doesn't work then it's not possible. I can't get my back off and the book that came with the phone doesn't help at all. The book doesn't show you how to get the back off. I've pushed and pushed and scared I'm going to break the phone. I've only had 2 days help..
You side the back down a short distance (about 1/4 of an inch) and then lift it off from the bottom. There's a picture on page 6 of this Manual. What kind of apps can you download on this phone that don't require connection to the internet in use? Are there a lot? Are there free ones? There are thousands of apps that could potentially work. Games, browsers, email and im clients, calculators and converters, ebooks and utilities. Most of the apps on BoostApps.com (my site BTW) should work. To find ones that work with out connecting to the internat look for ones that don't say "ad-supported" or "connection required". The one's taht don't require a connection will mostly be calculators, convertors, ebooks and some games. Is there a way to lock the browser key? I am accidentally pushing that key all the time when I do not want too. Is there ANY WAY to get a new Tracfone LG 500G to work with Net10. Apparently Tracfone does NOT work in Phoenix area but Net10 "supposedly" does.....???????? You can't use a TracFone on NET10. TracFone and NET10 have exactly the same coverage areas and both should work in Phoenix AZ proper. If your phone won't activate or you are having coverage issues you may have a bad phone or need a different SIM (AT&T instead of T-Mobile) call TracFone Executive Resolutions at 1-800-876-5753 Monday – Friday from 8:00 AM to 7:00 PM Eastern Time to get the issue resolved. How many minutes are used when you send a picture? "You will be charged 1.0 unit to send or receive a multi-media message such as a picture. In addition to the 1.0 unit multi-media charge, there will also be an additional Mobile Web Access Charge of 0.5 units per minute for the time it takes to send or receive the multi-media message. The total Mobile Web Access Charge will vary depending on the size of the multi-media message being sent or received. Picture Messages = 1.0 unit per message plus 0.5 units per minute of mobile access." Just wanted to say a big thank you for all the info here. Bought 2 of these phones(totally new to Tracfone) recently and have struggled with the virtually useless Quick Start guide Tracfone refers everyone to. Now I've got the more complete manual and answered questions, all via your post and the comments. Thanks, Yeswap! I second that. You ROCK yeswap! why did they put a camera in a phone that cant use it? is it just to save money? Not sure what you mean. The phone can use the camera and so can you. 3rd party apps like QR code readers can't. That's true of most non-smartphones on US carriers. The restriction was put into the Java runtimes several years ago when the carriers thought they could make lots of money selling users exclusive branded apps that could use those features. That didn't work out but the restriction is still there probably because the carriers think it helps with selling users pricey smartphones and the unlimited plans that go with them. Is there a way to get the pics I take with my phone to save on my computer? I have the cable that came with my Kindle and I've tried to use that to connect to my computer to download, but it doesn't work. Also, is there a way to email photos from the phone? You need to have a memory card in the phone and save or copy the photos to the card. If you can't get it to work with the cable a memory card reader attached to the PC should always work. To send a picture to email create a picture message and enter the email address in the To: field instead of a number. Any help avail for LG500 not turning on - completely dead - battery tested fully charged in another phone. This phone has just stopped working and only had it for 2 weeks?!? Help? Also tried plugging in with charger which usually lights up and lets u know it's charging but I don't even get this. Any help? Knowledge of this problem? Sounds like a dead phone. You should be able to get it replaced under warranty. how do I copy or save pictures and videos to the 4G SD memory card in my 500g? It saves now in the internal memory. I see that you commented that the LG 500 camera is too weak for QR scan, how does the LG 800g fair on this aspect and which app web site is best? I don't know of any QR Code readers that work with the LG 800G either. oldtimer, to save camera pictures to the card go to Camera > Settings > Others > Memory in use > External Memory. Yeswap, seems to be that you have a lot of wisdom about this LG500 ph, i have a question, i hope you can help me cause i called the tracfone guys and they don´t have an answer for me. I accidentally press the Browser key or right soft key, it takes my minutes, i know that the browser can not be removed but, is there any way to change the Browser option?, i mean instead of the word "browser", program the ph home screen to displays something like Messages or phonebook, some other shortcut that doesn´t take minutes if it is pressed accidentally. Can you please help?, Thank you. One thing you can do is Press the left soft button on the other side of your browser button. Leave it there (shows all the icons instead of the home screen) and it will go into standby mode (black no screen) so if something in your pockets hit the right soft key, it will not connect to browser and minutes charged. When you need your phone on again just hit any button and the icon screen will again show. If you need to view home screen with minute balance then just hit exit and return the home screen with the annoying browser button. Yes the battery icon changes to show approximately how much you have left. How can I change the time? I don't have that submenu under settings.